I like the look of overlapping shapes. 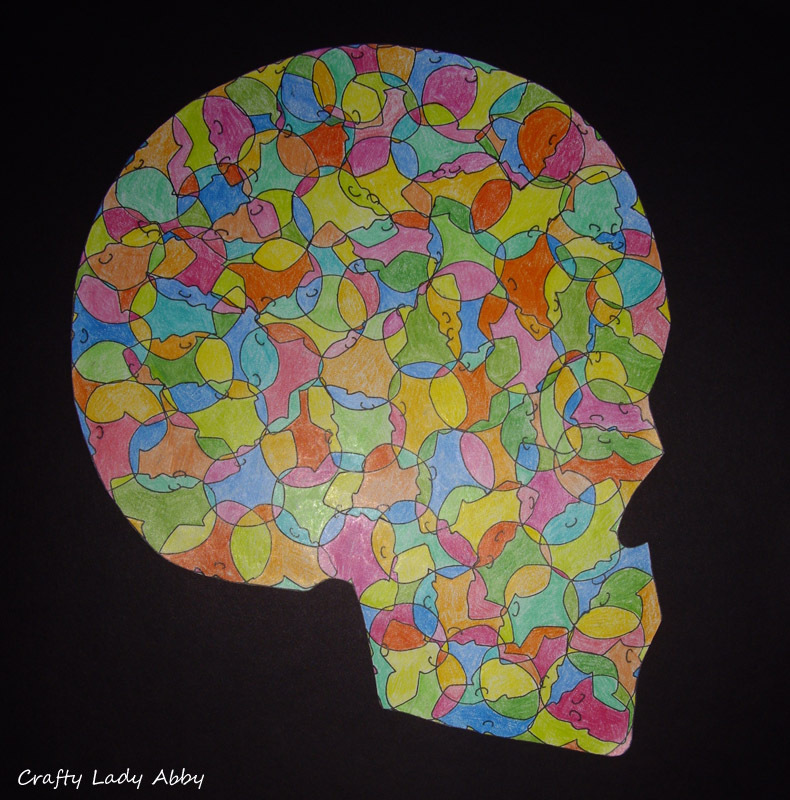 I wanted to do overlapping skulls within a skull and color in the different sections created by the overlapping shapes. This took a lot longer than anticipated. Making the drawing took about an hour. Coloring in all the sections took about five. As time involved as this was, it's for a friend's birthday. She loves bright colors, so I thought the color choice would be fitting of a cartoon-esque drawing. Drawing Paper - I used paper from a large sketch book. A Variety of Colored Pencils - To fill in the sections. You could use markers or crayons instead. I felt colored pencils would give me more control in the small areas. Black Cardstock - To mount the image on. Mine it 12" x 12"
1) Using your pencil, sketch out a large skull shape on the drawing paper. 2) Using your drawing pen, carefully trace the sketch, making a neat line. 3) Using the eraser on your pencil, neatly erase the pencil sketch. 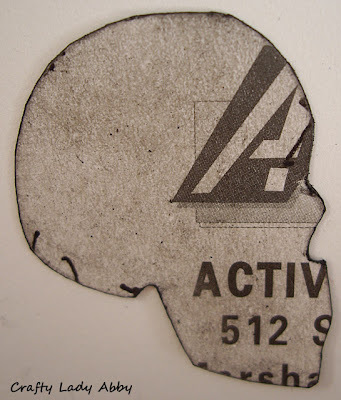 4) Using your pencil, draw a small skull shape on your scrap cardstock or posterboard paper. This will make a template for your overlapping skull design. Mine is about 1.5" long x 1" wide. 5) Using the small scissors, carefully cut out the skull template. This is a large photo of the template. It's dirty looking, because this is after I used it to finish my drawing. 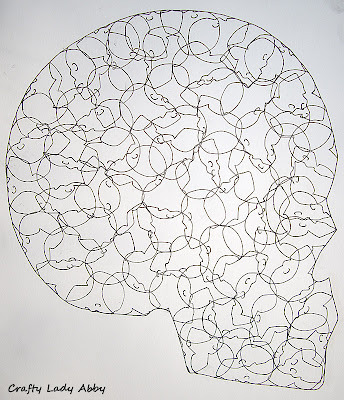 6) Using your template and drawing pen, hold the template down on your large skull and trace around it with the pen. Turn and flip your image each time you trace, so the pattern is interlocked. You will follow the shape of the outline of the skull for the edge. The rest is up to you. I tried to make the repeats connect at different intersections, so there were less tiny places to color. You might get smudges on the skull, but you will cover these with colored pencil. The rest of the paper doesn't matter. You will be cutting this away later. 7) Using the drawing pen, carefully draw "C" shapes for eyes. This is sort of tricky, since the small skull outlines are turned and flipped. Finished line drawing. Feel free to print this out and color it yourself. 8) Using the colored pencils, color in the sections. I tried to make sure no two shades touched. 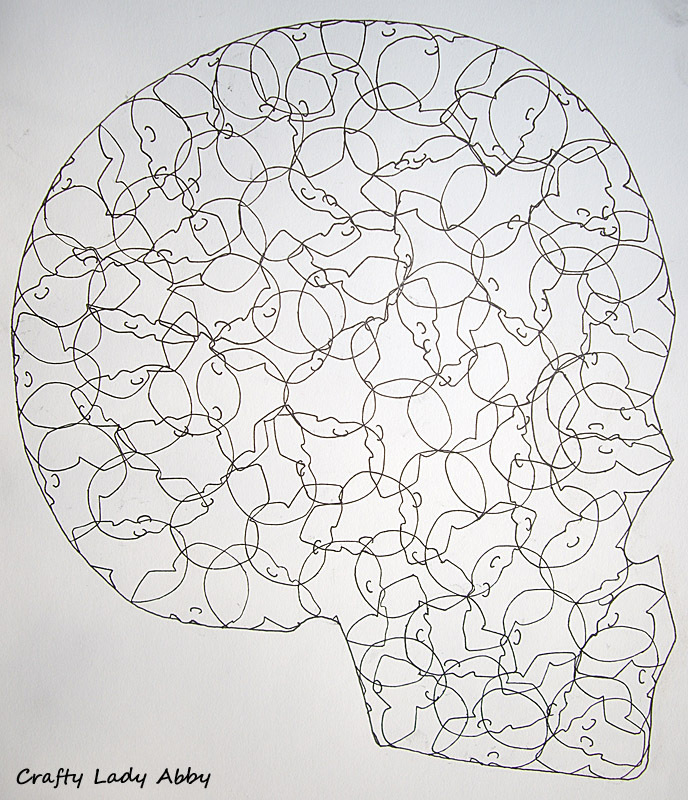 9) Cut the excess paper away, carefully following the outline of the large skull. `10) Using the glue stick, carefully apply the glue to the back side of the skull, following the edge. I did this in sections. I applied some glue, centered it on the card stock, and smoothed out the glued section. Then, I applied more glue along another back edge section, and smoothed it against the cardstock. This process is called mounting. 11) Sign your work on the black paper, with the metallic paint or gel pen. Mine is tagged via Photoshop, but before framing, I will sign it. 12) Flip your frame to the back. Take the backing off. 14) Place your skull piece in the frame, on the glass. Make sure it's turned correctly, to match the hanging hardware, so it will hang correctly. 15) Put the backing on again and secure it. You're done!!!! Hang it up on your wall and enjoy it!